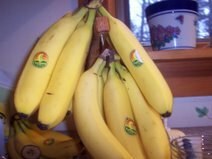 Yesterday was Brain Day on the blogs for me, as I read this post from Andrea at A Garden of Nna Mmoy followed by this post from Kristina at AutismVox, which both dealt with neurology and brain function. If you're a regular reader here, you may already know that Kristina is mom to almost-ten-year-old Charlie, who is autistic. 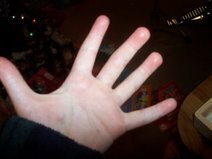 Andrea is not an autism blogger, but - for me - her post had as much to do with autism as Kristina's. I don't think I can summarize either Kristina's writing or Andrea's and do them justice, so please hop on over and read them. You're back? You read them? When read back-to-back, the two posts raise all kinds of questions for me about the nature of "mindlessness" and the nature of "mindfulness." Are they the same thing viewed through different filters? Or are they different things entirely? And what are their relative values? And by whose standards are those values determined? I left a fairly lengthy comment on Andrea's post, but as she is not an autism blogger she said she felt ill-equipped to respond to it. I'd love to hear what anyone else thinks about any of these issues. So, then, I wonder - to what extent is Bud experiencing - really, genuinely EXPERIENCING - more than I am, with all my words spilling over and diluting the experience itself? And then... what does that say about the way we look at and define "disability"? You wrote: "I have, once or twice, used the opportunity of a long meeting in which I had nothing to contribute or a presentation to enter a mini trance, and then had a question directed at me--and the difficulty of understanding, first of all, that the sounds had meanings, and I was expected to do something with them; and then determining what those meanings were, and what meanings I should be directing back, and how; and the sensation of those words coming from a long way away, as if I were unconnected to them, and the sounds coming out of my mouth were unconnected to me, was odd, though not unpleasant ... Even the feeling of speaking is different, as if one's mouth and tongue and throat are thick. Speaking is effort." And I wonder: Is this what my son experiences every day? I've mentioned my word thing before. I've mentioned it more than once. I'm about to mention it again. Well, a variation of it, at any rate. Grey - or gray - was a key word in my last post. I had to choose one spelling and stick with it. I started with "grey". Then I made reference to Carol Gray, so I went back and changed all the "grey" to "gray" - you know, so I'd look more clever. But the "gray" bugged me. It bugged me so much I had to go through and change it all back to "grey". Then I started to panic, so I did what I always do when I'm starting to panic: I turned to Google. I was surprised and, frankly, relieved to find that I was not alone in my grey/gray conundrum, especially when I found this post by Bernie Zimmerman from May, 2004... and its 146 comments. Zimmerman explains that both spellings of the word are acceptable, but he sums up the difference this way: "Gray is a color. Grey is a colour." Fascinating. Why, then, is it grey that speaks to me? I mean, really: despite my fascinations with Paul McCartney, Colin Firth, and Sarah Ferguson, I will never actually be British. Though I live in a cold climate and support socialized medicine, I will never actually be Canadian. I'm an American. I wait in lines, not on them. I go on vacation, not on holiday. If I wrote the word "colour," it would feel like an affectation. But I am all about the grey. "Some American writers tend to assign wistful, positive connotations to grey, as in 'a grey fog hung over the skyline', whereas gray often carries connotations of drabness, 'a gray, gloomy day'." That's it, I think. In a post that celebrates grey - that celebrates Bud and his unique grey matter - I was driven to steer clear of connotations of the drab and the gloomy. So grey. I'm sticking with grey. By which I mean no disrespect to Carol Gray. Oh, what a book. What a gorgeous, gorgeous book. 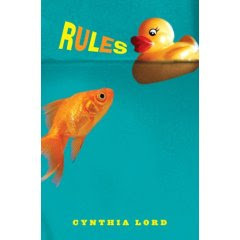 I just finished reading Rules by Cynthia Lord, which is a book geared for children in Grades 4 - 7. In other words, it's ostensibly too old for Bud and too young for me. But we both love it, albeit for different reasons. Bud loves the book itself. I bought it a couple of weeks ago and added it to the stack of books-to-be-read that clutter my bedroom. Bud found it there and adopted it. He carted it around with him from room to room. He tucked it into his bag when we left the house. He browsed through it while he ate his breakfast. I think it spoke to his artistic sensibilities. "RULES FOR DAVID: Chew with your mouth closed... If someone says "hi," you say "hi" back... No toys in the fish tank." What Bud didn't know, of course, was that he was reading a list of rules composed by the book's narrator, twelve-year-old Catherine, to help her eight-year-old brother David navigate the world. David loves rules, Catherine tells us. David has autism. David is, in fact, quite a lot like Bud, which made me fall in love with him almost instantly. But Rules is not really David's story; it's Catherine's. And it's beautiful. I won't say too much, because I don't want to spoil it for you. The story passes too quickly as it is - I started the book yesterday, and sped through until there were no more words to read. So I won't ruin it by giving you summaries and synopses and overviews. I'll just say this: Rules is a book about being a parent, being a child, being a sibling, and being a friend. It's about ability and disability and about how we all manage through life with a healthy dose of both. It's about growing up and growing wise and making mistakes and making things right again. It's about integrity and respect and understanding and love. And it is, very deservedly, a 2007 Newbery Honor Book. I bought my copy of Rules at big box bookstore, but later discovered that I could have ordered a personalized autographed copy through Cynthia Lord's website. I'm sure I'll have opportunity in the future: this is a book that demands to be given as a gift. When you start this book, read slowly. It will come to an end long before you are ready to say goodbye. I've had a book on my mind all week. It's not Portia Iversen's Strange Son, although my post about that is what sparked my thinking about this book. This comment and this comment made me think about it even more. that you find yourself and keep as long as you can - maybe forever." In two scenes toward the end of Strange Son, Portia Iversen talks about the rock that her son Dov carries with him. In both scenes, Dov loses his rock and becomes visibly upset and dysregulated. Dov needs his "special rock;" it grounds him. It is his own, very literal, touchstone. I've been thinking about Dov and his special rock for the past couple of weeks because I've noticed that Bud has recently had a tight grip on a metaphoric touchstone of his own: the Teletubbies. Bud has been a fan of the Teletubbies since he was a year old. We don't know why the Tubbies are so special to Bud; we only know that they are. In his early years, Bud was consumed with the Tubbies. His earliest language and his earliest echolalic scripts drew heavily from Tubby-style baby talk. The rest of us had a love/hate relationship with the Tubs - or "the guys," as Bud calls them. We hated their slow-paced repetitive sequences, their infantile words, the banality of their plot lines; we loved how happy they made Bud. In recent years, Bud's passion for the Teletubbies has come in waves, with each wave seeming to lessen in intensity as the Tubby tide appeared to be going out. In recent months, especially, Bud's interest in other shows and other characters has continued to grow, and while he still played with Tubby characters, the books and the movies sat untouched as Bud seemed to be moving on. In the past couple of weeks, though, the Tubbies have made a comeback, and life is once again All Tubbies, All the Time. 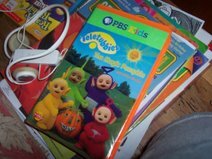 The Tubby movies are in high rotation, the Tubby toys are the only ones getting attention, the Tubby books are strewn throughout the house. I found myself feeling discouraged by their reemergence, and regarding it as a setback. I started wondering if Bud's peers would start to tease him - this seven-year-old who likes baby things. I started to bristle when I saw Bud engage in Tubby-play. Then I read this post on AutismVox, in which Kristina draws a parallel between the Tubbies and the other "Fab Four" from England: The Beatles. And that helped me regain some perspective. What I remembered is this: The Beatles in general, and Paul McCartney specifically, have played the same role in my life for the past thirtyish years that the Tubbies have played in Bud's for the past six. They have grounded me. They've been my rock. The Beatles didn't really make my first car run smoothly. But as I drove away from the dealership having made the first significant purchase of my adult life, I flipped on the radio and heard the opening strains of "Drive My Car," and I was certain that it was a sign that I had purchased well. Perhaps Paul McCartney didn't intend to write a song that would make me feel close to my children. But when I listen to his album Flaming Pie, and I hear him sing "It was written that I would love you from the moment I opened my eyes...I'll hold you for the rest of my life," I am certain that he did. And I know that The Beatles didn't really get me out any faster when my car was stuck in a snowbank last week. They didn't keep Bud and me from being an hour late to school and work. But, even so, as we sat waiting for rescue with the engine running and listened to the radio play "Help me if you can I'm feeling down, and I do appreciate you being 'round," I felt strangely reassured. My connection to the Beatles hasn't kept me from branching out. I listen to lots of different music. I have a wide range of interests. But despite that, the Beatles always lurk on the periphery of my life, and now and then - especially in the midst of challenge - they take center stage. I imagine, though I wouldn't ask (because "nobody is supposed to know what's special about another person's rock"), that the Tubbies provide the same sort of comfort, shelter, and sense of home for Bud. In that context, I can see clearly why the Tubbies came back in full force during what probably felt to Bud like an extended period of upside-down: a week of too-sick-to-go-to-school, followed by a week of school vacation, followed by a week of Nana-and-Papa-are-on-vacation-and-every-day-is-a-little-bit-different-from-the-last. Though Bud has been revisiting the passion he's had since he was a baby, he is not reliving his infancy. He is approaching the Tubbies as a seven-year-old: working with me to add his Tubby books to his Library Thing account, reading their stories out loud to me, inviting me to help him create elaborate Tubbylands on the kitchen table, playing Director as he makes his characters act out the scenes on the videos he's watching, filling pages with gorgeous abstract art in purple, green, yellow, and red. He's not talking like a baby. He's not "retreating into his own world." He's not regressing. And we all do that in some way, don't we? Sometimes the things that ground us are actually made of stone. Sometimes they're fuzzy and they play movies in their bellies. And sometimes they just sing silly love songs. But everybody needs a rock. Artists of alpine. Masters of the mogul. Superstars on the slopes. Bud had his very first lesson today through an adaptive ski program for people with disabilities. I hadn't prepared him very much - we'd talked about it, of course, but I'm not a skier, so I couldn't give him the step-by-step of what he could expect. Luckily, Bud didn't need the preparation; he was a natural. We were greeted by the two instructors who would be working with Bud for the day. They helped him get fitted for boots, helmet and skis, then we headed to the bunny slope. Bud was comfortable on his skis from the start, and after just a few minutes of sliding on the level ground at the bottom of the slope one of the instructors asked my husband and me if we'd like to take a break. I took his point right away - Bud would be better able to pay attention to their instruction if he wasn't so focused on us. I told Bud that his dad and I were going to find the bathroom and that we'd be back in a little while. To my surprise, Bud was fine with our departure and as we walked away from the slope, he turned back to his instructors to get his lesson underway. We wandered over to the lodge for coffee, and after about 30 minutes we decided to sneak back to get a view of him, just to make sure that he hadn't gotten worried because we'd been gone so long. As we walked back to the children's area, we saw another staff member from the adaptive ski program walking toward us. "Are you headed back there?" he asked. I immediately pictured Bud in tears, inconsolable, believing he'd been abandoned. "Good," he said. "They asked me to come find you so you could see him in action. They said he's doing a great job. Try to stay where he can't see you, okay?" "Okay," we answered, resisting the urge to break into a run. We got back to the children's area and slipped into a warming hut with a wide window. They were right: Bud was doing a great job. He was riding a little lift to the top of the slope, then gliding gracefully to the bottom. His instructors struck just the right balance of staying close enough to make him feel safe and far enough away to make him feel independent. Each time they ascended the slope they took him a little further up. As he descended, he held out his arms and bobbed his head from side-to-side. Though I was too far away to see his face or hear his voice, I could read his body language clearly: Look at me, he said. I'm flying! About 90 minutes into his two-hour lesson, his instructors stopped to consult with each other (to determine, I found out later, whether or not to move over to a larger hill.) I watched Bud as the instructors chatted. He faced away from the slope, and his face scanned the group of strangers collected at the bottom of the hill. "He's looking for us," I said to my husband. "I think he's starting to worry." As if on cue, his instructors turned their attention back to him, and after a brief interaction the three of them headed toward us. We exited the warming hut and joined them. The instructors had picked up on the same change in Bud's demeanor as I had, and they responded right away. We were scheduled for an afternoon session as well, and they thought that Bud would be ready for a larger incline once he'd had a break. We asked Bud if he'd like to ski again after lunch, and he said that he was tired and ready to go home. We decided not to push it and to end on a positive note, so we all headed back to the office to return Bud's gear and cancel the afternoon session. As I got Bud unbundled and ready to go, my husband chatted with one of the instructors. Bud had done incredibly well, the instructor said. He'd made more progress than most kids do in their first lesson. "He's going to be a great skier," he said. We stopped at the lodge for an après-ski chocolate chip cookie, which Bud munched as we headed back to the car. "Bud," I asked, "Was it a hard day or an easy day?" "An easy day," he said. "Do you want to come back another day and ski again?" Without question: A gold medal day.